It is endemic to Tuolumne County, California, where it is known only from a small section of the Sierra Nevada foothills at Rawhide Hill and the Red Hills. It is a plant of serpentine soils. ↑ Calflora database — Allium tuolumnense. Accessed 2013-02-05. 1 2 eFloras.org. Accessed 2013-02-05. ↑ Denison, S. S. & McNeal, Dale W. 1989. Madroño 36(2): 128. 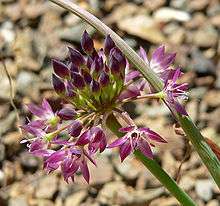 Wikimedia Commons has media related to Allium tuolumnense. This article is issued from Wikipedia - version of the 8/17/2014. The text is available under the Creative Commons Attribution/Share Alike but additional terms may apply for the media files.